Connecting consumer-grade equipment to a professional sound system is always a pain. It happens to all of us, though, so we had better come up with some plans on how to handle it. Sure, you can get a 1/8” to dual 1/4” cable made, and that might work OK when the laptop, iPhone or iPad is at FOH. But what about those times when a visiting speaker wants to run some audio from his laptop on stage? Or the MD decides this would be a great week to do an all iPad band? Or you just need to run a click out of a smartphone on the drum riser? We can root around in the adapter box and come up with janky solutions that will work, but as often as not, you have problems with buzz, noise and hum. And let’s be honest, it doesn’t look professional. 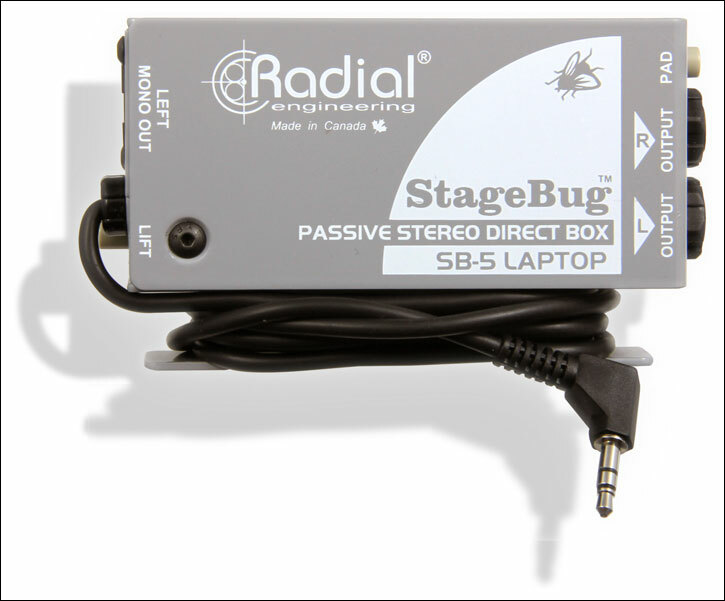 Enter one of the newest creations from those smart Canadians at Radial Engineering; the Stage Bug SB-5 Laptop DI. Laptop DI’s aren’t new—in fact Radial makes others, the ProAV1 and ProAV2—but this has a few features that make it unique. First, it comes hardwired with a 5’ cable terminated with a 1/8” plug that conveniently stores wrapped up around some heavy duty cleats on the side of the device. I was glad to see the 1/8” plug was small enough to plug into my iPhone without removing the case. It has both a set of stereo, balanced TRS outputs and a summed mono balanced output on a single XLR. A −15 dB pad drops hot inputs to a manageable level, and a ground lift switch ensures you won’t have any ground loop issues. Like all Radial units, the housing is heavy gauge steel, and it’s likely it would survive being run over by the tour bus. Inside that housing is a set of custom wound transformers that drop the impedance and balance the signal. Radial claims cable runs of up to 300’ are possible with the SB-5, something I didn’t test, but have no trouble believing. We have quite a few Radial DIs on our stage, and I’ve never had any issues with them. I really do like the fact that the 1/8” cable is hardwired to the unit. Those things can be incredibly hard to find during a soundcheck when you’re scrambling to find a way to hook up a rogue device. And invariably, one side doesn’t work, which sends you looking for another. The fact that it’s permanently attached to the box means you’ll never be without it. I suppose the downside would be if the cable goes back, the SB-5 is dead. But Radial has a good warranty, or you could just solder on a new one. Radial has a well-deserved reputation for high sonic quality and the SB-5 is no exception. Before doing any real listening, I hooked up my laptop to my studio Mac Mini using the SB-5. I ran the 1/4” outputs into my Focusrite Saffire interface, using the front mic inputs (the SB-5 outputs mic level, even on the TRS jacks). Using SMAART, I set the laptop to output pink noise and looked at the result on the Mini. I expected to see a reasonably flat trace with some roll off at the low and high end. What I saw was a laser-flat trace that was flat from 20 Hz to 20 KHZ. I honestly didn’t think I would see that kind of frequency response out of a headphone jack. I switched over to some music to listen to, and was equally impressed with the sound. The Eagles Hotel California sounded as haunting as ever. The low end was very tight and the cymbals sounded just like they should. I was going to compare the output of the laptop running directly into the interface, but decided not to. Given that the frequency response was so flat with the SB-5 in the loop, it’s clearly not doing anything adverse to the signal. My daughter plays keyboard in the band at times, and likes to use her own keyboard. The challenge is that it only has a headphone jack. So I figured it would be a great test of the SB-5. I put a 1/4” to 1/8” adapter on and plugged the keyboard in using the Stage Bug. We have a grip of male TRS to XLR adapter cables, so we used those to get to mic inputs. The result was perfectly clear sound. No hum, no noise, no buzz. It’s worth having one of these for something like this alone. At a street price of about $100, the SB-5 is certainly more expensive than a cheap 1/8” to dual 1/4” cable. But you’d never get a 100’ run out of such a cable, let alone 300’. And the ability to lift the ground might be the thing that saves the day. The SB-5 is very small, roughly a third smaller than their standard sized DIs, so it will easily fit in a backpack, workbox or hard case. This is the kind of tool that just about any traveling audio guy should have, and it’s equally useful for the church environment. In fact, even though they gave me this unit for the review, I’m going to order a few more to have around the church—I can see that many uses for it.